Meat Allergies in general, are fairly uncommon. However reactions can range from anaphylactic to digestive issues. Avoiding certain meats may be more complicated if you are extremely sensitive, for instance, even certified vegan products can be made on the same line as meat and milk products. People who avoid meat, for religious reasons, often have certification measures that are more restrictive. For Jews not eating pork is the most observed kosher practice. 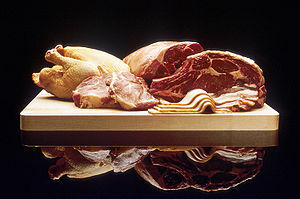 Muslims consider eating products derived from pork violation of their dietary laws as well. Muslims mark products that comply with their dietary laws as Halaal meaning “lawful” or “permissible”. The foods that meet Jewish dietary laws have Kosher labeling. Both are “pork free” with almost no cross contamination issues with pork. Jewish people who observe dietary laws do not mix milk and meat. If you are also allergic to milk, be aware that in Jewish law, a food product may be considered pareve, if it contains a very small amount of milk. Food marked parve could potentially have enough milk protein in it to cause a reaction in a milk-allergic person. Most halaal gelatin is made from beef not pork so it can not be considered vegetarian. Hidden Pork usually in the form of gelatin includes marshmallows, candies, ice cream, jello, vaccines. There are vegan and Halaal variations of marshmallows, jello and other foods. Making Vegan marshmallow or gelatin is difficult to make, and also hard to find. Karen Blue runs the avoiding milk protein website. For me my issue is with all meats (chicken and fish are the worst) I have been hospitalized 3 times in the last 2 months because if accidental (secondary) exposure; could (would) the Alpha-Gal testing be dangerous for me or even apply to my issue? I’m having trouble finding answers. I just have a question for everyone. I read more comments here and found the tick connection About two years ago, I was tested for lyme disease, which came out negative. Is the alpha gal test different than the lyme disease test? As far as I know, I have not been bitten by a tick, but I do spend every summer at my mom’s cottage in the woods in Michigan, so I guess it’s a possibility. Does anyone know if the lyme disease test is the same or different from the alpha gal? From my understanding, the alpha gal is different from lyme disease. I have been allergic to beef and pork for nearly 10 years. I was diagnosed via the scratch test and my allergist was shocked. I have since discovered that my daughter is headed down the same path and our new allergist was very excited to have a genuine beef/pork allergy patient in his office and shared the tick alpha gal theory with me and was excited to test my daughter. I am certain I was never bitten by a tick and she was not either. His test confirmed that she was not, and he advised her to follow my strict diet of no beef or pork before her sensitivities escalate to the point of my anaphylactic allergy. I am convinced that our allergy is a crazy genetic issue as we have discovered other distant relatives who also have the same allergy. I was sensitive intestinally to beef and pork my entire life before the rash and other symptoms became worse. If you have avoided beef and pork strictly, then the blood allergy test will not be accurate. The scratch test was done on me though before I had cut it out of my diet and was aware of a true allergy. Now I am super strict and cannot even be in the same room while it is cooking. I am also reacting to meat. My brain goes dead and I cannot think at all (also numb). In addition, the right side of my body goes weird. It is not just with meat, either. It seems to be with any protein (lentils). Can someone be allergic to protein? Is this a gut issue? I have already diagnosed myself as Histamine Intolerant (others might want to look this up–it seems like some of you might have this issue, causes a lot of problems including headaches, rashes, etc.). But, I am following the Low-Histamine Diet and still have problems with protein. I did see one Low-Histamine Diet that says not to eat any meat at all. I’ll try that and see if it improves. This is a very restrictive diet, but if it helps, I’ll do it. I’ve been very ill for three years. Please, everyone, check out Histamine Intolerance. It looks as though some of you may be suffering from this. I don’t know if the dead-head issue with me is also connected to this, but I’ll go meat-free (and protein) for a few days and see how it goes. But, how can we live without protein? The Low-Histamine Diet also bans most dairy, nuts, seeds, legumes and many more protein foods. I share your concern for eliminating protein. Proteins are the building blocks of life, where as carbohydrates are the fuel, although proteins work pretty well as fuel also. Best to have a balanced diet. But if you’re having a reaction to all these foods, I can see why you’d want to cut out proteins. I suggest you search for a complementary set of proteins that work for you, and find a doctor who can help you find out what is really wrong. Easier said than done and some doctors can send you off in the wrong direction, especially with food issues, but I do think you should try to get guidance on this. Also from a nutritionist, that could be very helpful. Actually, I don’t think people become allergic to all proteins all of a sudden. Generally, it is one or more proteins that set off the immune system, but not all, so I wonder if you have some sort of imbalance, maybe micro-nutrients, vitamins, etc. Would you consider paying out of pocket for the appropriate testing? Would your insurance cover treatment? That’s really too bad. Good luck! Oh, one more thing. I’ve been gluten-free for over two years now, but I decided to do an experiment and go totally grain-free for a week. I felt better. When I added grains back, I felt worse. Now, I had other health stuff going on at the time, so I’m not really sure if all grains are a problem for me, but it opened my eyes to the possibility. I’ve been very ill and have not been able to eat at all for many days at a time. My head clears up quite a bit if I don’t eat at all. My doctor said that this is very typical for someone with a digestive problem, which is why she wanted to test me for SIBO. I already had a histamine problem going on and ended up in the ER three times, but she wanted to know why. She has said that SIBO and a suspected Leaky Gut can send bacteria into your body, including your brain. I’m with you, Cami. I feel that my brain has taken a real hit over the years and wonder about long-term damage (my first symptom was a stroke-like episode that landed me in the hospital for five days.. Proteins are very hard for the body to digest and with impaired digestive issues may be why we’re having such problems. If you have SIBO like me, carbohydrates feed the bacteria and cause symptoms. So much of this is experimentation and listening to your body. It’s hard, though, because sometimes symptoms will show up right away and sometimes it can take several days, so hard to know exactly what is happening. All my best to you. P.S. My insurance may not pay for all of this either, so at this point it’s out-of-pocket for me, too. I wonder if you’ve taken a log of antibiotics? They can kill the “friendly” bacteria, allowing the wrong kind to grow instead. Hope the herbal approach works. No, I really haven’t taken many antibiotics throughout my life, but apparently still have digestive problems. My Mom said I cried a lot as a young girl and said my stomach hurt, so who knows?, maybe I’ve had this thing forever and has just now become out of control because of menopause??? Cami, I’m wondering if it was the gluten in the cookie and not the egg or maybe the sugar or another ingredient. It’s so hard to tell unless you test one item at a time. Currently I’m Gluten-Free, Dairy-Free, Sugar-Free, Migraine-Free (tyramine), Low-Salt, , Low-Protein, Organic and pretty much, Flavor-Free. It’s been an extreme challenge. Not only am I brain-dead most of the time, I also have extreme migraines, seizures and many other maladies. I’ve been very ill for three years, have had many tests and the only thing that came back positive is SIBO and Low Vitamin D. So, I’m going with these and see what happens. There is a book that I’m going to explore called “Eat to Live” by Dr. Joel Fuhrman. He states that many migraine problems are because of too much protein in the American diet. He advises that it only be eaten twice a week–not sure if that means meat or other protein sources, I’ll need to read to find out. So this leads me to believe that protein definitely can cause other problems, including digestion as well, in sensitive people. But, being on this strict of diet has actually really helped. I suggest that you take one category and delete it for awhile (a month, probably) and see how you feel. I felt much better when I deleted gluten; it was a big turning point for me. Good luck! I am glad that you are doing better Elisabeth, this is definitely a metabolic disorder and everything in the body is connected. I meditate too, it seems to help with the brain chemistry. Good luck, and keep posting. All my blood tests are perfect, I had high cholesterol three years ago, but after vegetarian diet everything is back to normal. I do want to get tested for protein intolerance , and I will try the amino acid Citrulline . I’ve tried everything, lol, but nothing seems to be working. Today I lied down for an hour, brain dead, didn’t eat protein. I’ll let you know how it goes. For the past several years I have had a serious problem digesting red meat any kind of beef products and a lot of times I am lactose intolerant. I had never heard of being allergic to beef is it possible? I have been not feeling well for a couple of months now. Had severe hives sore when I scratched and the doctors had no answers. I was put on a prednisone pack which helped and now symptoms returned . Then got really sick again after I ate a burger. It hit me! I googled my symptoms and found this sight !! THANK YOU ALL !!! I now can go to my specialist and show him this and get some right answers !!! Thank you all again ! I suggest you cut out meat for a while and see if it makes you feel better. That may give you all the answers you need. Doctors will not necessarily take an article on a site like this and decide to see the light! You don’t need a doctor’s permission to change your diet! Good luck. I just found out I have a beef allergy. Wow, I have never heard of that. But all my life have had problems with certain food and cosmetic. Like sunscreen, lipsticks and shampoos. Do these use beef by-products? Can anyone tell me what label names to look for. I have found Gelatin and Tallow. What are the hidden label names. What else do I need to look for. Do they have to label it has animal ingredients. Please tell me what to do next. because I’m so confused. You’re best bet is to avoid meat. Everytime I eat pork,or beef I get these real bad headaches that last non stop that I can;t get out of bed for being so sick, I never had to turnn down neat before this is going to be real hard, The headaches are like I want to pull my hair out now evevyone looks at me like what about ua, because I do all the cooking in my house, I like meat but I can’t stand the painful heads, my arms goes numb when it happens, I’ve been crying for the last couple of days, because I don’t know where to turn. I have this condition please write me. I have never been able to eat any red meat – when I do the roof of my mouth & my throat get’s itchy, asthma starts acting up, etc. When I was little I was also allergic to eggs (not anymore). If someone is cooking red meat on a frying pan inside – the same thing happens. I have never seen a doctor for this – too afraid that they are going to tell me it’s a mental thing. I have gone through life just telling everyone “I’m allergic to all meat except for chicken” (I can eat turkey but not a fan of it). Nope not mental. Find an allergy doctor familiar with alpha gal allergy and get an alpha gal blood panel test. I bet you are positive which means No red meat. yes there is a blood test for meat allergies. They search for antigens or antibodies that indicate a sensitivity to meat. Skin tests do little for many allergies because the body doesn’t let it get as far as the skin once the allergen is ingested. What is the name of the blood test? When i eat corn my body attacks the cartilage mainly in my knees. When i eat soy, instant migraines with cerebral swelling, which only started after the first time i tried Singulair. I have a redundant colon which i think my body grew to save me from gluten. If i slip up and eat gluten i get ibd-c. Every time i finish a course of antibiotics i become allergic to a new protein. This is because the meds killed my good enzyme-making gut flora. Sometimes i can get back “lost” protein by eating a tiny amount once a week and build up immunity over time . I’ve got to stop deluding myself. Right now it’s pork.